The usual crew of Rick, Janice, Alvin, Queenie, Kevin, Grace, Diana, Sean and Amy were armed (with camera) and ready to be stuffed full of food once again. 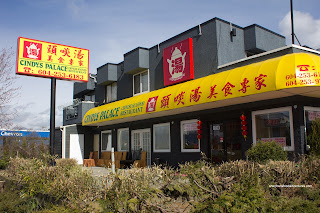 We actually began the meal with Dim Sum items, but since I've already blogged about it, I'll skip to the Lamb & Fish Hot Pot. More of a soup than a typical hot pot, the broth was sweet with only a touch of gaminess. Whole garlic and ginger rounded out the flavours. 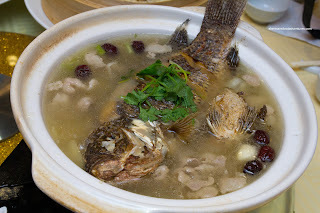 Naturally, with a whole fish in the soup, there would be bones and this was no exception. 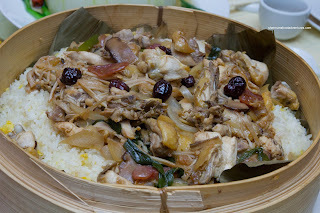 Next up was the Steamed Chicken on Rice in Lotus Leaf. In this application, the free-range chicken had actually been wok-fried first with shiitake, enoki, green & white onion, Chinese sausage and ginger before being placed atop the egg-fried rice base. This way, there was much more flavour and caramelization than merely steaming it from raw. A byproduct of wok-frying it first was the inherent greasiness of the product. But then again, I'd take that over bland wet chicken. Being free-range, the chicken was a bit chewy, but the flavours were good, especially the sweet onions and shiitake. Loved the rice as it was chewy and not wet. 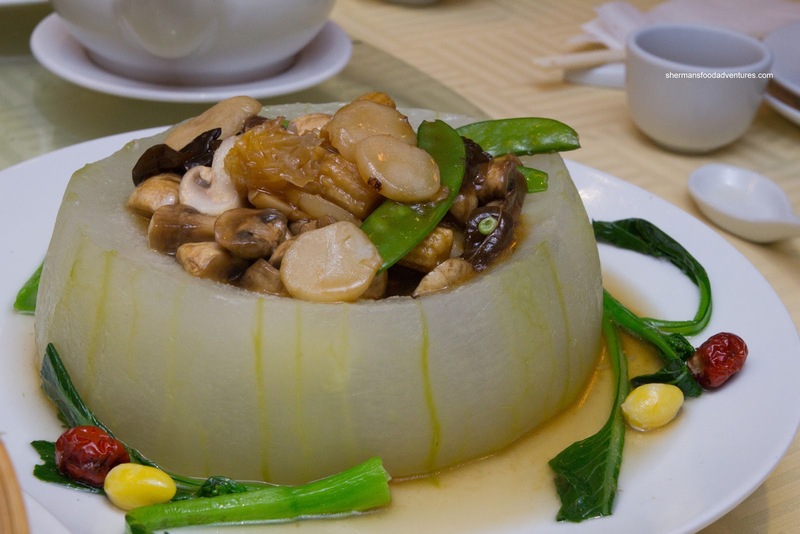 Presented in an edible Wintermelon "nest" was Stir-Fried Vegetables which consisted of water chestnuts, snow peas, button mushrooms, white fungus, wood ear mushrooms, ginko nuts and baby corn. 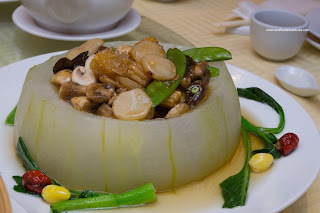 This vegetarian dish was all about the textures as the crunch from the snow peas and water chestnuts contrasted nicely with the soft watery Wintermelon. The flavours were mild, yet the ginger really stood out. Continuing on the serve-the-food-in-a-vegetable theme was the Stewed Pork Spareribs in a whole pumpkin. 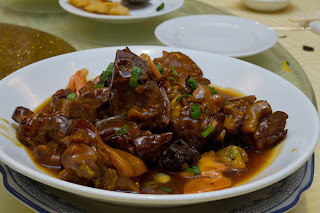 Essentially, this was a larger version of the black bean spareribs found during Dim Sum. The meat had a nice bounce and was tender. There was a sweet garlicky flavour which was pretty strong. 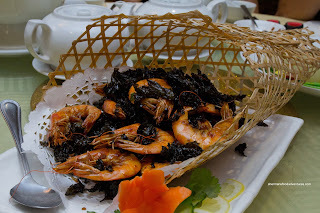 Arriving in a lattice basket (of sorts) was the Stir-Fried Prawns with Special Tea Leaves. Although I could clearly see a lot of tea leaves, it really didn't come through with flavour. 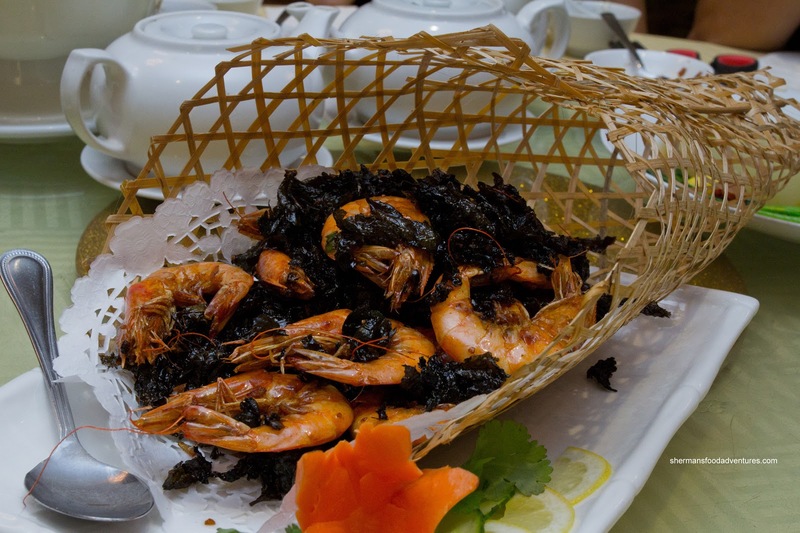 The prawns were slightly overdone, but were naturally sweet. 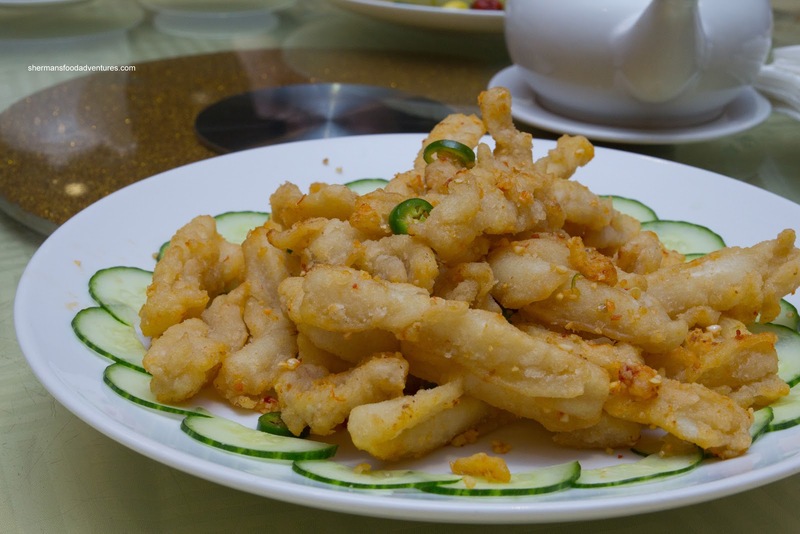 Another hybrid dish (could be Dim Sum or dinner item) was the Deep Fried Squid with salt & pepper (garlic and chilis too). 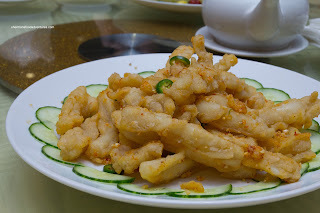 Although fairly crispy, I found the squid to be slightly overtenderized, hence there was no bite. The flavours were also quite muted as there was little in the way of spice, but there was a decent garlic hit. This was the only dish so far served on an actual plate. But that trend bit the dust as the Stir-Fried Pork Cheek with vegetables was served in a fried wonton wrapper "nest". 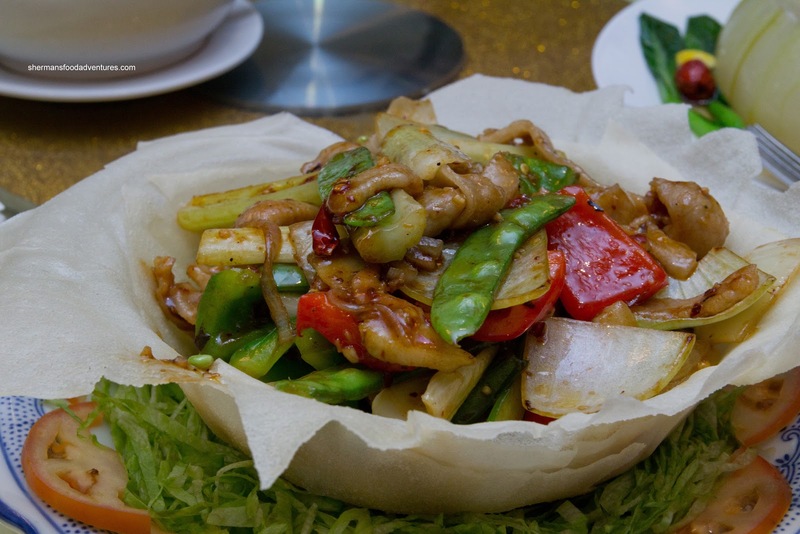 The dish was glistening with oil as it was literally wok-fried. Naturally, it did produce good caramelization of flavours and there was a noted level of spice. The veggies were crunchy and vibrant while the pork cheek was moist with a slight chew. Then we had a dish that was reminiscent of a dish associated with post-partum women - Brasied Pork Hock with Special Preserved Plum Sauce. While not exactly the same dish, there was this sweet tart vinegary ginger flavour going on. 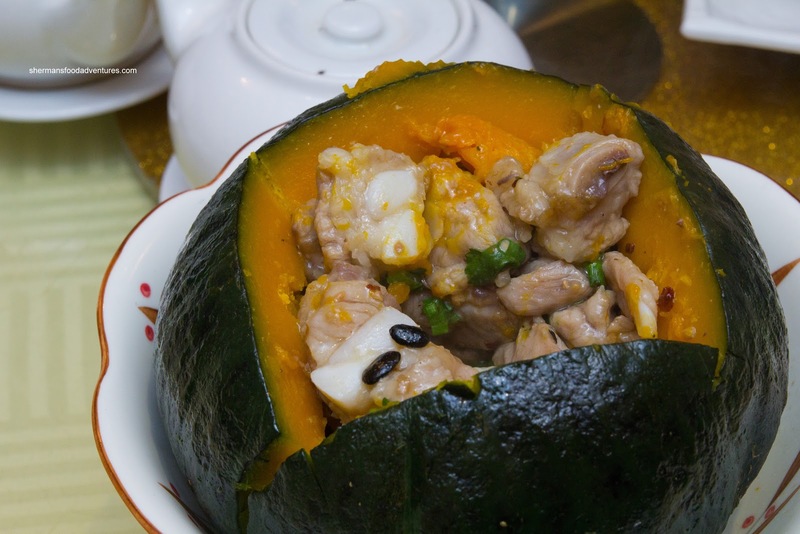 The pork hock skin was soft and gelatinous with equally soft tendon and meat underneath. I happen to like pork hock and in particular, the actual "gewn cho" where the sauce is sweet vinegar-based (the post-partum dish). Yes, I am not afraid to admit it - I ate most of Viv's portion when our parents made a big pot of it... Shame shame... Anyways, the next dish was a curious one. It was the Panfried Vermicelli with Beef in Black Pepper Sauce. I've had this dish countless times in the past, but not quite like this. 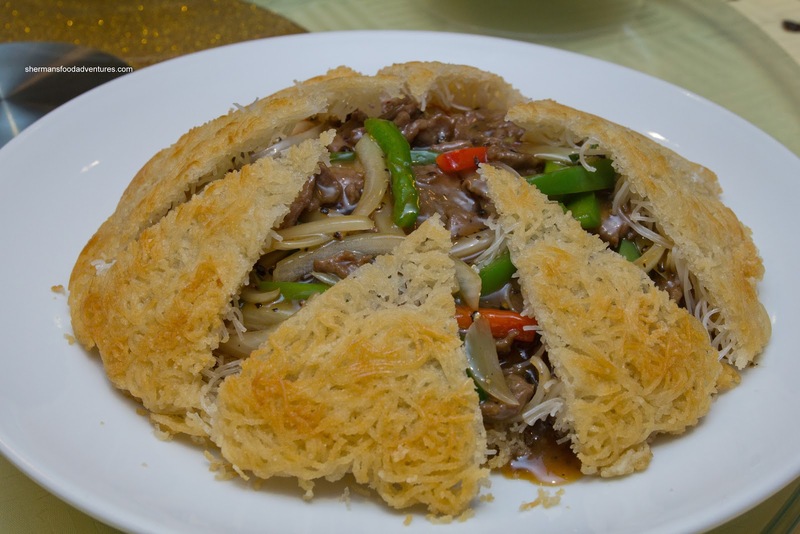 They literally panfried the vermicelli in one piece so it became a pancake of sorts, then the cut it up into wedges and placed it on top of the rest of the noodles and ingredients. The flavour of the dish was fine as well as the tender beef, but I think the crunchy (and chewy) noodles were more of a hindrance to the dish as opposed to an addition. For our last savoury dish, we had Cindy's Special Fried Rice with egg, green onion, Chinese sausage, dried shrimp and gai lan stalks. 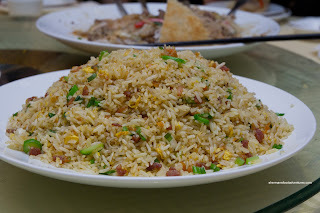 This was a well-prepared fried rice which was nutty, chewy and with enough flavour. To celebrate Halloween, the first dessert was made to look like miniature pumpkins. These were actually made with pumpkins being the Baked Pumpkin Pastries. These semi-sweet morsels were soft and really greasy. Squeezing them was not a good idea. 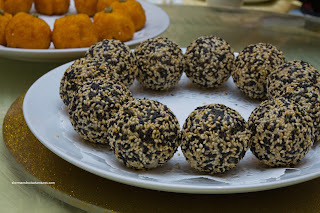 Lastly, we had the Glutinous Rice Balls with Sesame Paste. These were visually appealing with both black and regular sesame seeds adorning the exterior. They balls were crunchy and the sesame paste was not overly sweet. I liked this dessert for its texture. Naturally, as this was a hosted dinner, the chef's tried their best to be creative and original. Kudos to them for that even though not everything worked as planned. Yet, the bottom line is that the dinner as a whole was decent enough.